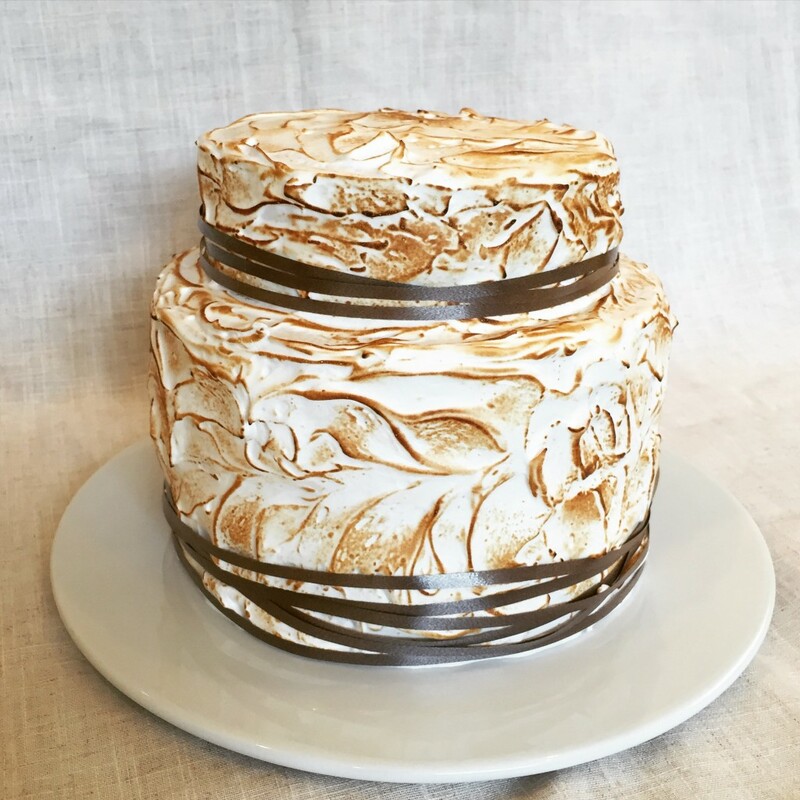 Layers of cinnamon flavoured cakes are sandwiched together with chocolate ganache and Italian meringue. A very sweet treat, but once the outer layer is torched, this Birthday cake makes an impressive centrepiece. This one is still my favourite, even though my daughter wouldn’t eat it! 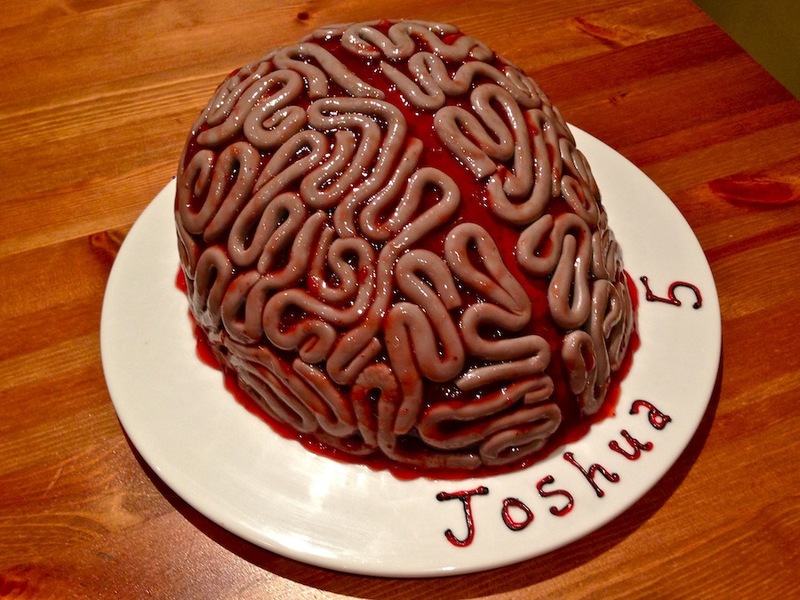 I filled a triple layer red velvet chocolate cake with chocolate buttercream and carved it into a basic brain shape (think cycle helmet). I then covered the whole thing in more buttercream and randomly covered it in long ‘sausages’ of purple-grey fondant. Strawberry jam – with lots of lumpy strawberries in it – smeared all over gave it the ‘yuck’ factor! Thankfully, Joshua LOVED it! Everything apart from the ribbon was edible on this cake. I made the death star and the middle tier from homemade rice-krispie treats and the bottom cake was chocolate cake with chocolate buttercream. I held the figures together (and to the cake) with pieces of raw spaghetti. 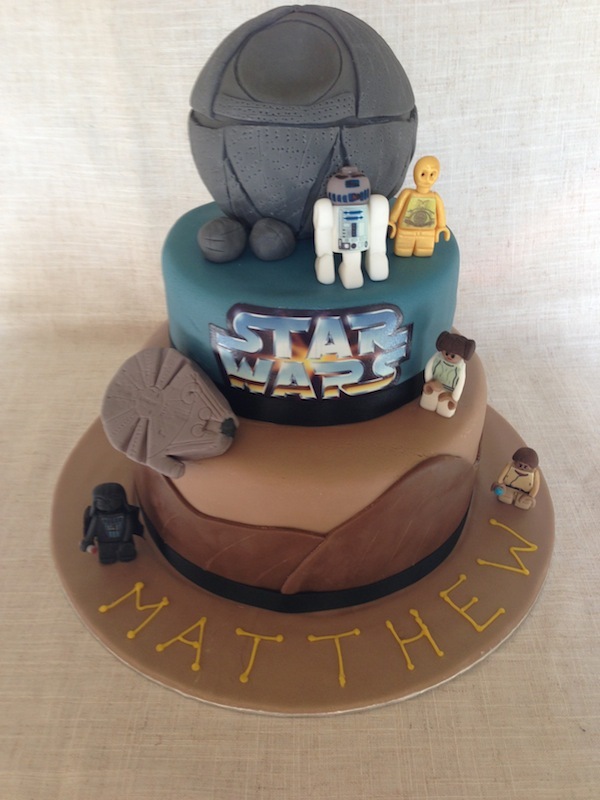 Details on the Lego figures and the Star Wars logo were printed on edible icing sheets. For a good friend on her ‘special’ Birthday, a two tiered chocolate cake with chocolate ganache filling and decoration. 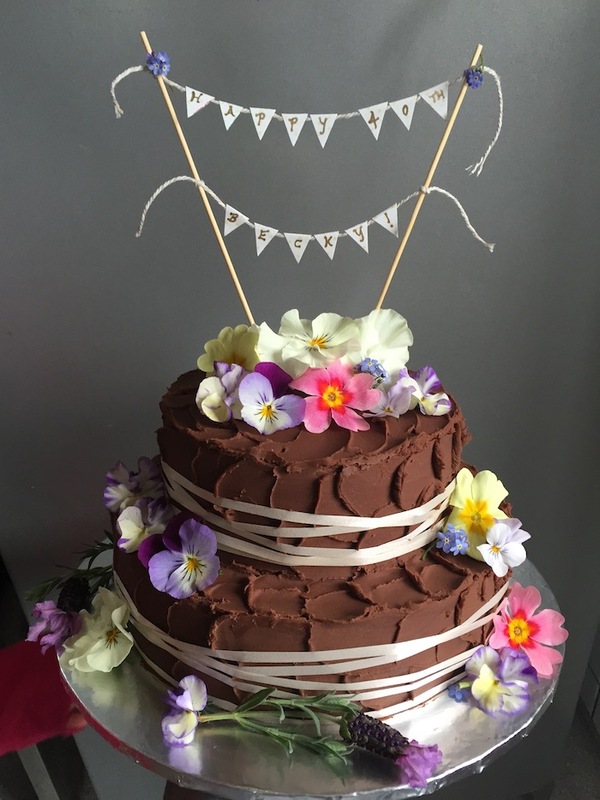 Simple ribbons were intended to complement the pretty edible flowers and the personalised bunting made it really stand out. 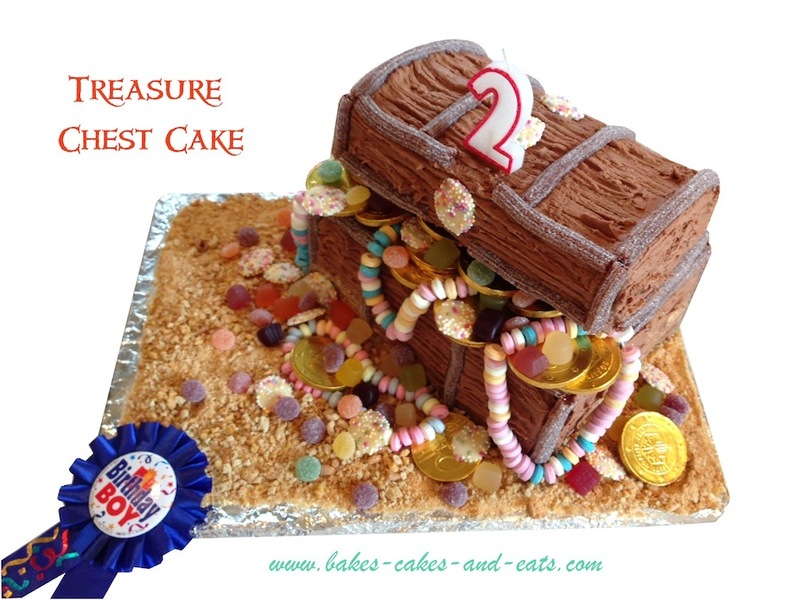 For this pirate themed Birthday party, I made separate chocolate cakes for the base and top of the treasure chest. Chocolate buttercream covers and fills the cakes and it is decorated with cola laces, candy necklaces, gold coins and miget gem ‘jewels’. The ‘sand’ is made with crushed up Cheerios to help complete the Treasure Chest / Pirates theme. Thomas loves his Mr. Happy teddy and asked for a Birthday cake to match! 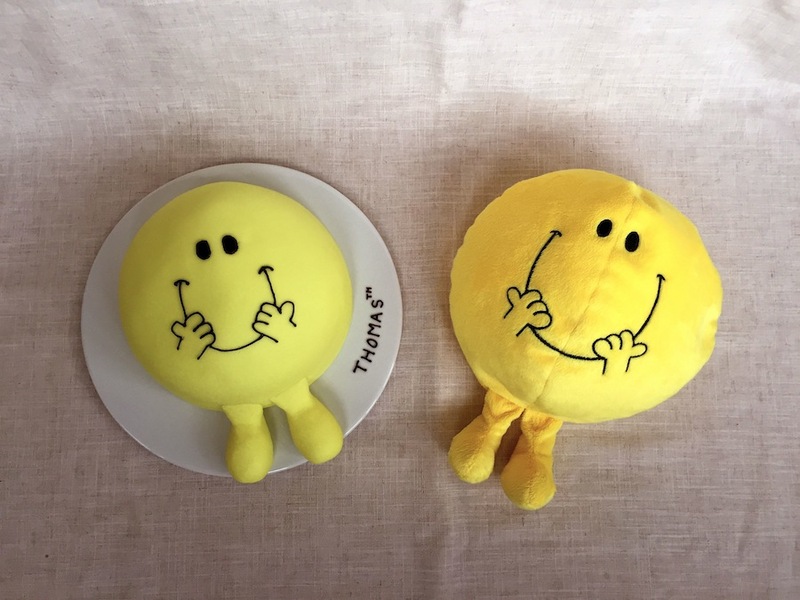 A triple layered chocolate and vanilla cake filled with vanilla buttercream, shaped and covered with bright yellow fondant icing. 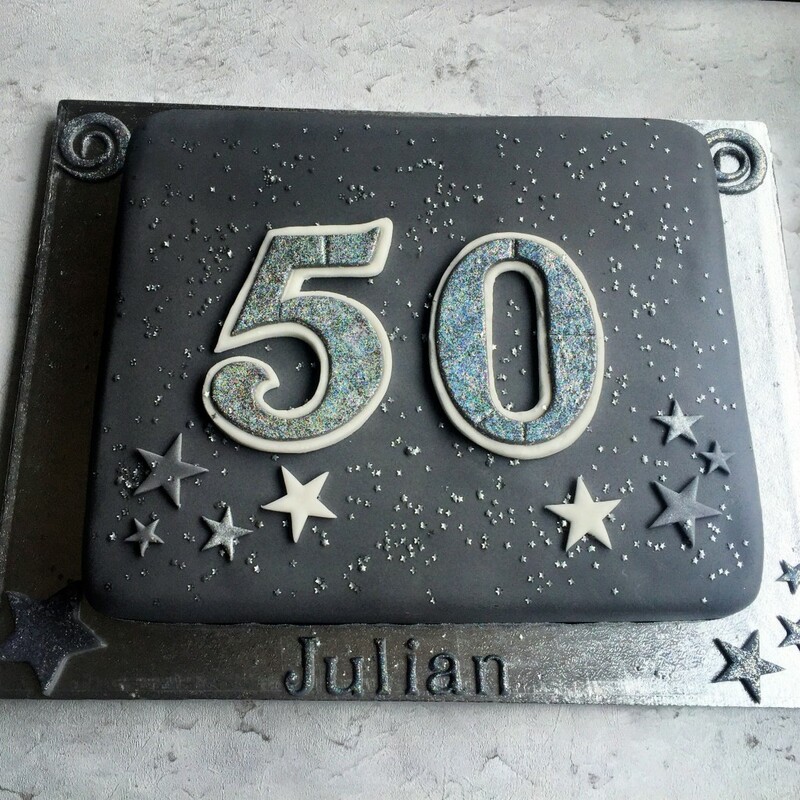 For this one, I baked a chocolate sheet cake and lay a number 5 template over it. I then cut around it and sandwiched the layers together with chocolate ganache, using the offcuts to build height and a good rounded shape. 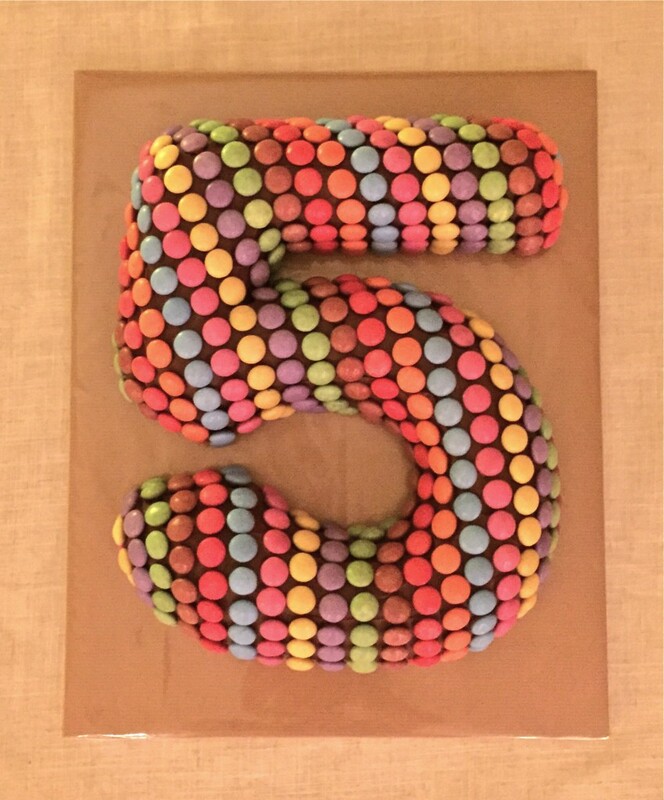 Once the whole cake was covered in ganache, I covered it with Smarties for an effectively bright Birthday Cake. Three layers of brown sugar cake sandwiched together with homemade salted caramel sauce and vanilla buttercream frosting. 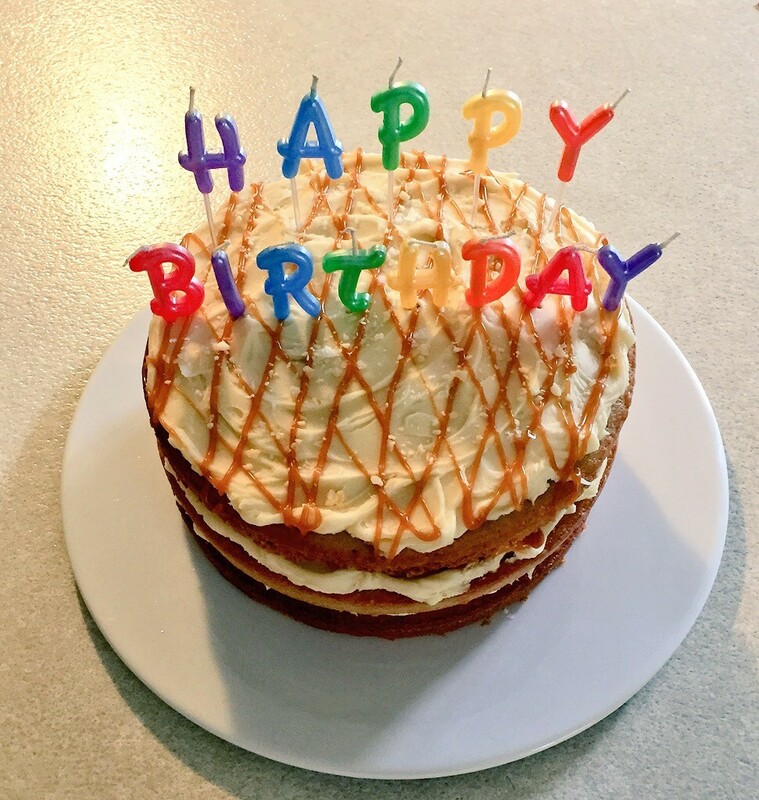 Drizzled with salted caramel and topped off with popping candy and bright ‘Happy Birthday’ candles. This one was a real challenge! 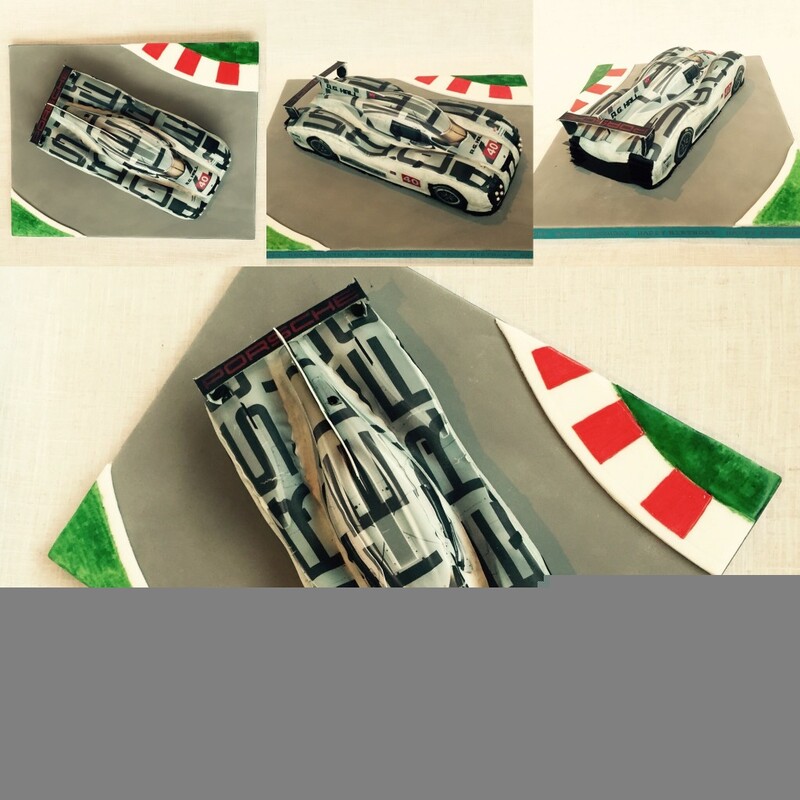 I used printed icing images and stiff gelatine sheets to help create this Porsche LMP1 chocolate birthday cake. 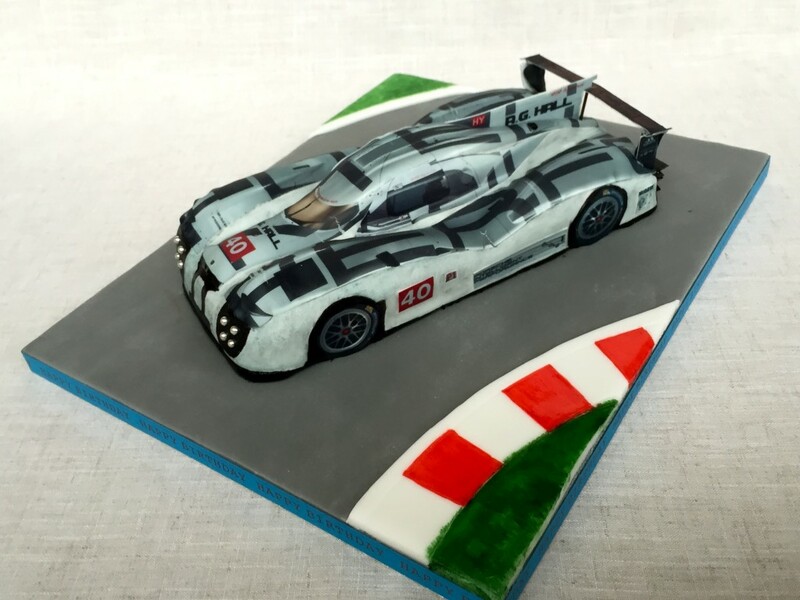 Some alternative views of the completely edible Porsche LMP1 Birthday cake. 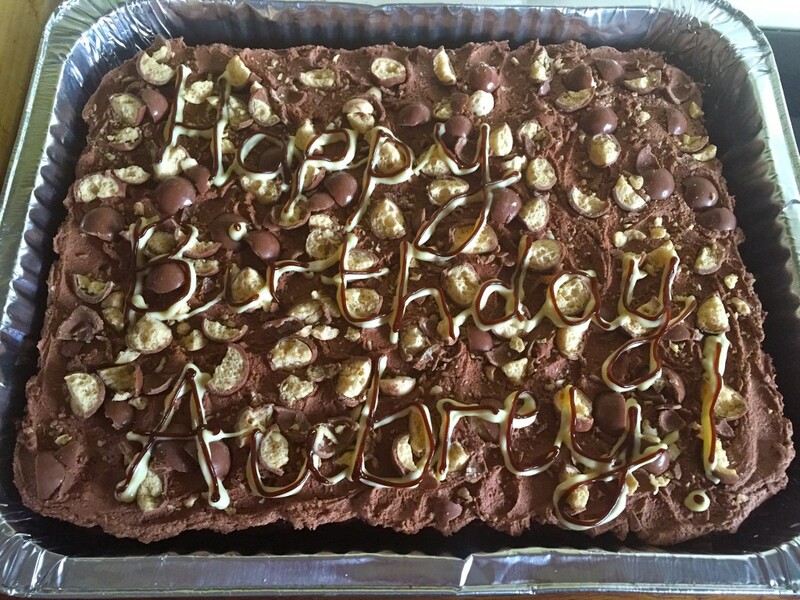 A chocolate sheet cake – sometimes called a traybake – decorated with chocolate buttercream and crushed maltesers. Aubrey wanted to share this with his classmates, so the sheet cake seemed the best option for easy transportation and cutting into school-friend sized pieces! A big celebration for Julian’s 50th. Chocolate cake with chocolate ganache filling. Fondant icing covering and lots of icing stars and edible glitter decoration. Cake fountains completed the look at the party. 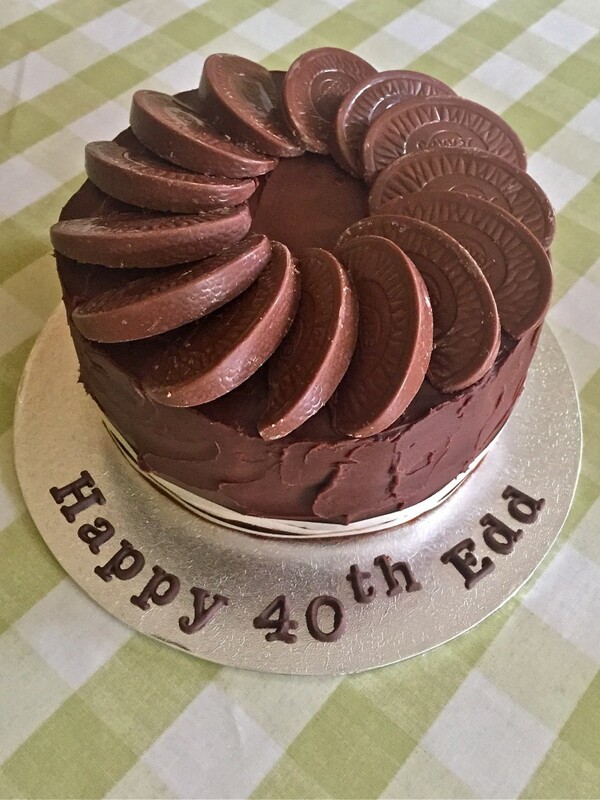 Relatively simple… I made a triple layer chocolate orange sponge cake, sandwiched and covered in my own chocolate orange ganache. Chocolate icing lettering and segments of milk chocolate orange with a simple ribbon complete the decoration. 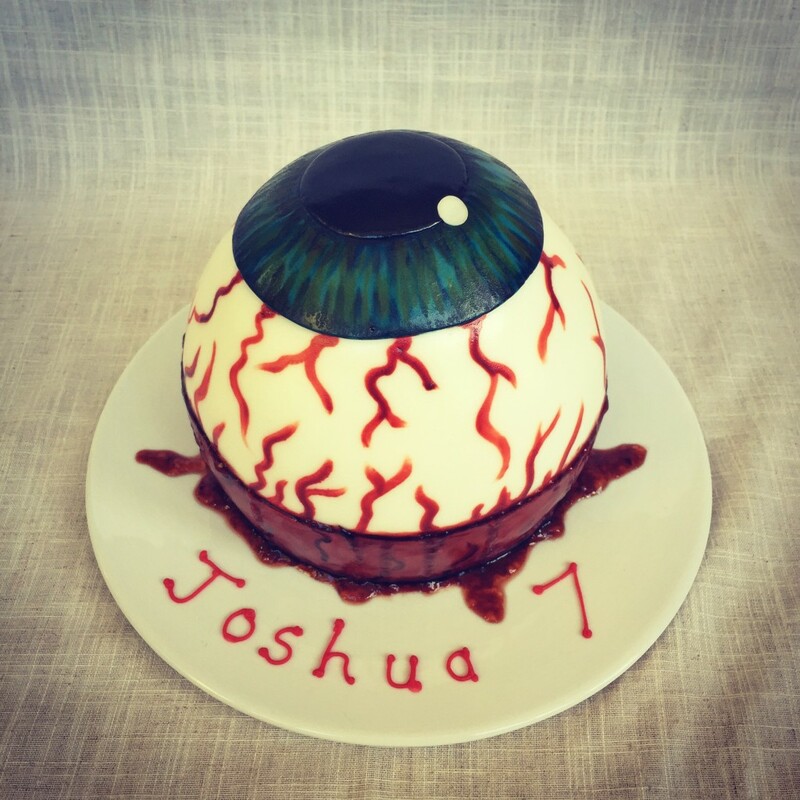 A gory eyeball cake for Joshua’s 7th Birthday. 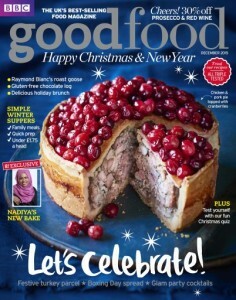 Strawberry jam helps to add a ‘gross factor’! Richard uses a real Fujifilm X100s. 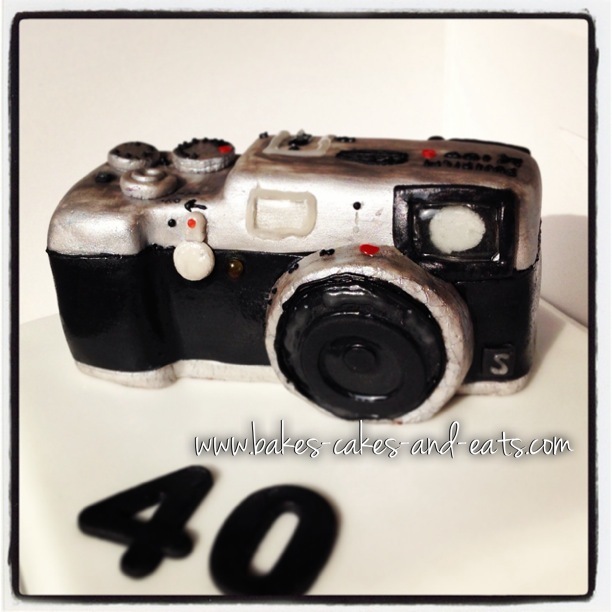 I made a cutting cake to sit this mini camera cake on, using isomalt for the lens. 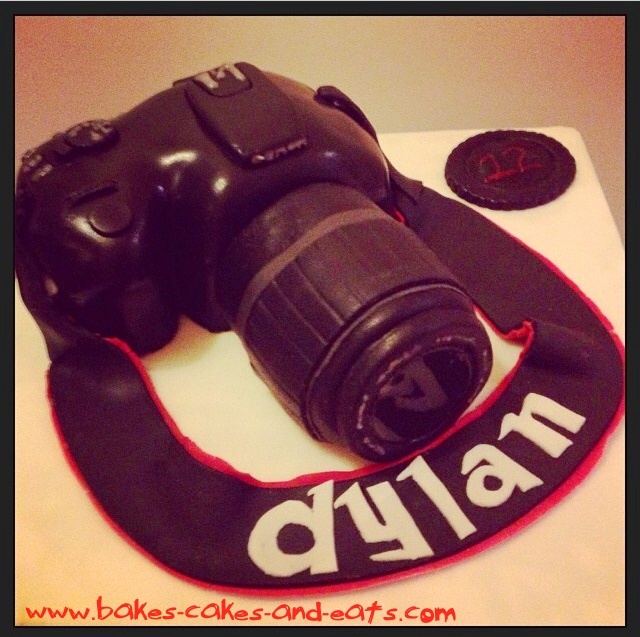 Everything on this Canon 400D camera cake was edible. It was a chocolate cake with chocolate ganache filling. Shaped and chilled before covering in black fondant icing. I copied the Canon font to write Dylan’s name on the strap. I made an isomalt disc to give the lens a realistic shine. This chocolate birthday cake was stacked, filled with chocolate ganache and chilled before I shaped it and covered with white fondant. 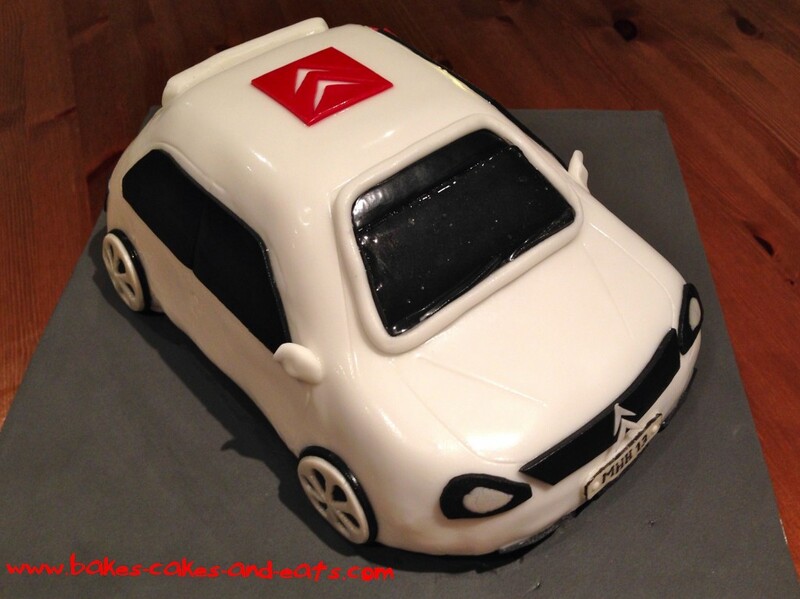 All the Citroen Saxo details were made with coloured fondant and once again, I used isomalt for the windscreen to give it a lovely shine. 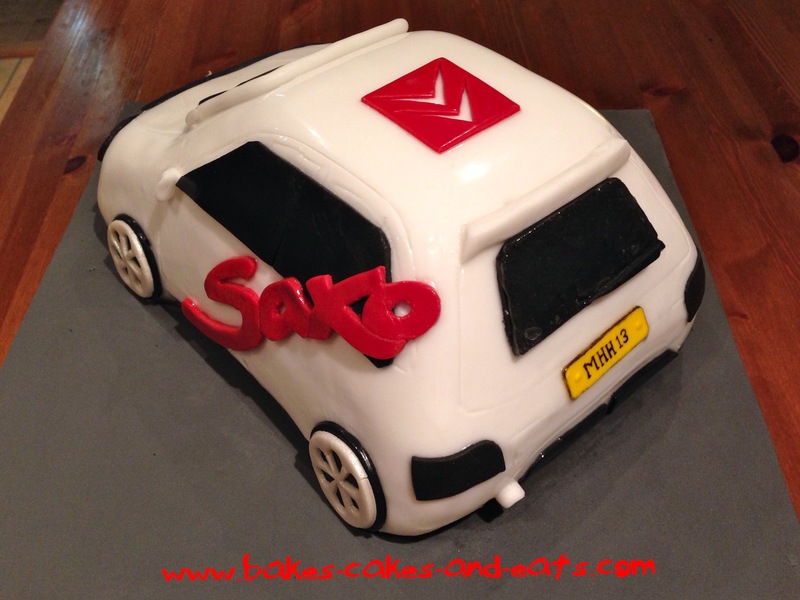 Back view of the Citroen Saxo Cake. 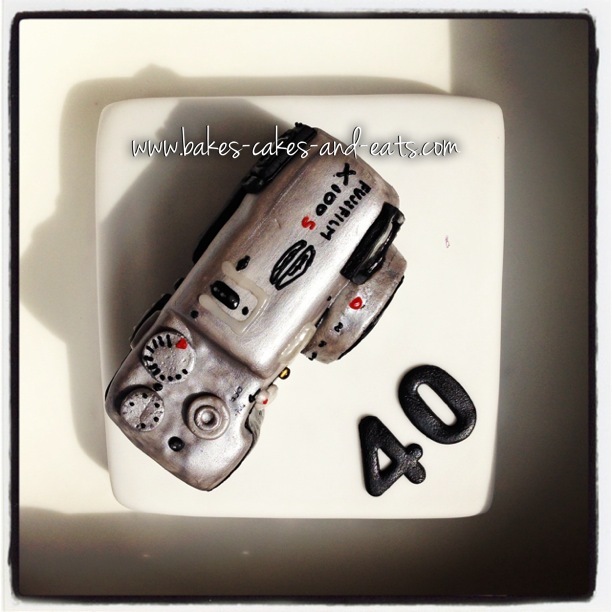 Have you made any similar cakes? I’d love to see them, so please feel free to share yours in the comments below. 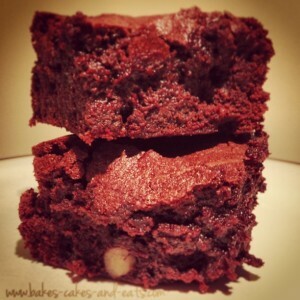 New look website for Bakes, Cakes and Eats!